So I start the well-salted water boiling for the pasta. Once that was going, I toss in the pasta and set the timer for 10 minutes. In a large frying pan, over high heat, I put in the frozen vegetables and some water, and put a lid on to let the steam thaw them. Meanwhile, I diced the ham, and the leeks, and stir them in to heat up, too, along with the mustard and thyme, mixing the mustard in with the water to loosen it. Once the pasta is done, I remove the lid and, using a spider, I put it in the pan with the butter. I waited until the water was almost gone, stirring frequently, at which point I turned the heat to low, and added the cream and the cheese, and let it simmer for a couple of minutes. Start to finish, 17 minutes, not counting the time it took for the pasta water to come to the boil. 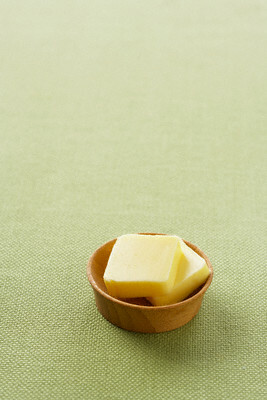 Over at TuttiFoodie (a foodie weblog that emails new content to subscribers) today’s entry is all about making butter. Talk about turning a mistake into an advantage. I’ve done it before, but never on purpose. If you try to make whipped cream and you get distracted, it’s easier than falling off a log. And I’m not really sure that the end result is really anything to swoon over. I doubt it’s more economical. But anyway, if you’re going to make your own butter, I think I’d probably add a little salt into the mixer, but I bet some brown sugar or honey, after you’ve drained off the butter milk, might be pretty good, too. Traditionally, this recipe calls for shredded gruyere cheese, but jack cheese, or even smoked gouda works well, too. If you want to save some calories, you can replace the cream with either milk or chicken stock that’s been thickened on the stovetop with a roux of a tablespoon each of butter and flour. Preheat the oven to 350°. Grease an oval gratin pan, or even a small cast iron frying pan, with a little butter or olive oil. 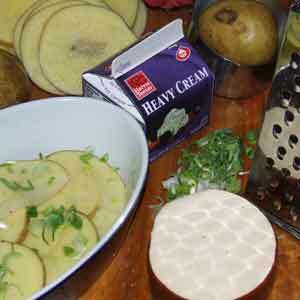 Lay down a layer of potato slices, covering the bottom. Sprinkle with a little salt and pepper, and the diced onion. Add a little cheese, and moisten the layer with cream. Repeat 2 or 3 more times. Cover the pan with foil, and bake for 60 minutes. Remove the foil and cook 10-20 minutes longer until the liquid is bubbly.